I absolutely love brunch. It’s the perfect time of day. It’s a socially acceptable time to drink. And you can totally do sweet or savory. The options are endless. And that’s where I can get stuck sometimes…the options are endless and it’s always a tug-of-war with my taste buds. 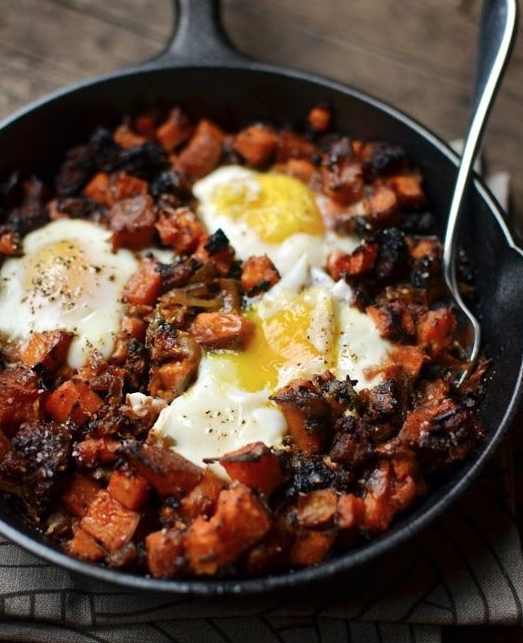 Until I found this recipe for Sweet Potato Hash with Caramelized Onions, Sausuage & Eggs. And the tug-of-war ceased. I can have it all after all. Sweet and savory all rolled into one amazing dish. This sweet potato hash pairs ooey-gooey caramelized onions…with crumbly fennel-filled sweet sausage…and aromatic roast garlic and rosemary. And then you add a fried egg on top. Whaaaaaaaaaat!? I know. I know. My mind was blown when I read that for the first time, too, and I thought there was just no way this couldn’t get any better. And then I ate it. Hot out of the oven. Sweet. Savory. Melt in your mouth and soaked in a fried egg. It’s pretty much fifty shades of ahhhhhhhh-mazing. This is the absolutely amazing re-heated in the cast iron for breakfast the next day. And it’s also amazing for lunch. Heck, why not make a day of it and have it for brinner (breakfast for dinner! ), too!? We have been eating hash pretty much for every meal since yesterday. And I promise you’ll want to triple the recipe and savor it for days, too. And days. But I can’t promise there will actually be any left by then. Between the three of us, 8 servings was gone in about 36 hours. There’s no shame in my game. It’s just that good. My only modifications? I shred my sweet potatoes in the Cuisinart. I (at least) double the olive oil I add to the sweet potatoes. I spray the cookie sheets so the hash doesn’t stick. And, I use fresh sweet sausage from Rosemont Market (our local food market) and I truly think that makes all the difference. So. Next time the weatherman is calling for snow? Or you’re having company over? Or it’s a holiday? Or just because you love amazing food…head to the grocery store and stock up. It won’t disappoint. I promise.